Sage X 590-4 5 WT 9 FT Custom Made Fly Rod -- Free Shipping!!! This taper allows you to dig deeper into the rod and access the lower sections, shifting power closer to the angler. This is a Custom Made Sage X 590-4 Fly Rod. 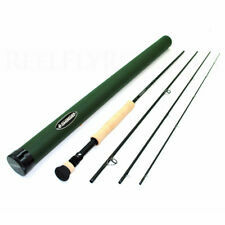 I have also included a Sage Ballistic rod and reel case with this fly rod. Sage's most versatile and popular saltwater rod model. The 890-4 X is able to effectively present flies and handle the fight with bonefish, redfish, striped bass, largemouth bass or other similarly-sized species. Sage X 890-4 Fly Rod : 8wt 9'0"
The Sage X Rod 8wt 9'0" is the best model for heavy freshwater like steelhead or salmon to the perfect model for bonefish, permit, or smaller redfish. The 8wt is truly the most versatile saltwater model that you can incorporate to you collection. Sage X 590-4 Fly Rod : 5wt 9'0"
This Sage X Rod 5wt 9'0" is the ultimate all purpose trout rod for any situation. This 5wt is also great as a lighter smallmouth bass rod and will launch smaller bass bug straight to their target. A premium Vera wood insert adorns the stealth black laser etched reel seat. Sage X 690-4 6 WT 9 FT Custom Made Fly Rod -- Free Shipping!!! This taper allows you to dig deeper into the rod and access the lower sections, shifting power closer to the angler. · Nickel Silver Pacific Bay Reel Seat with Box Elder Burl insert. · Pacific Bay Nickel Silver Up-locking Reel Seat with Box Elder Burl insert.